How does a 128-year-old major financial institution reinvent itself for a high-tech, customer-centric world? How does it seize new opportunities in martech (marketing data analytics) to expand its customer base and grow the business? That was the challenge facing SunTrust Bank, one of the 10 largest banks by deposits in the U.S., with 1,400 branches across 11 states and a national presence with consumer lending, corporate and investment banking, commercial banking, and commercial real estate. SunTrust sought a global-brand executive education partner that could offer the perfect blend of academic thought leadership and real-world business expertise. In addition, the firm desired a learning solution truly customized for their unique needs: one that would serve as the ideal complement to their evolving business strategies. It takes every function in the organization to drive growth, and it was important for us to provide cross-functional teams with the common language of an analytical approach to do that together. We needed a program customized to address our distinct business challenges and that would deliver tangible results. 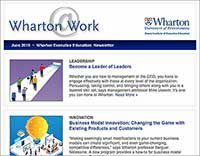 SunTrust chose Wharton as its learning partner based on its world-class expertise in both marketing and finance. After extensive discussions with SunTrust leaders, Wharton created a program that incorporated SunTrust-specific examples and spoke directly to the bank’s marketing needs. 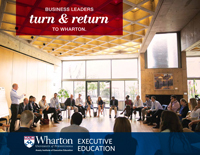 The two powerhouse brands came together for a program titled Wharton Series on Advanced Strategies in Digital Marketing and Analytics. An additional session, delivered virtually, tackled the critical subject of technology evolution and its impact on the banking industry. Attendees included both senior marketing leaders and leaders from other parts of the organization, including analytics, strategy, data, and the major business units. SunTrust and Wharton had determined that this arrangement would enable a wide range of departments to become familiar with the latest digital marketing advances. Thus, executives would better understand the value of new approaches initiated by the marketing team. Moreover, the blended participant group would help “bust silos” by improving cross-departmental dialogue. A special feature of the program was the hands-on Customer Centricity Simulation. Participants found themselves responsible for a theoretical business, trying to drive growth with limited resources. They were faced with tough tradeoffs: Do you spend more on branding? Distribution? Product quality? The simulation delivered a deeper understanding of the decisions a marketing department has to make when striving for customer centricity.